AKIPRESS.COM - The administrative center of the northern province of Turkmenistan - Dashoguz - hosted celebrations marking the completion of the mission of the city of Dashoguz as the cultural capital of the CIS in 2016. This event was celebrated at the city palace of Ruhiyet (spirituality), bringing together representatives of the Ministry of Culture of Turkmenistan, representatives of the CIS Executive Committee, the Interstate Fund for Humanitarian Cooperation of CIS member states, workers of culture of the CIS countries, as well as the Interstate TV and Radio Company “Mir”. Pavilions with exhibits of the original traditions of the Turkmen people, cultural heritage and national art were set up at the palace of Ruhiyet. The participants also visited the regional Historical Museum and a great library. According to Deputy Chairman of the Executive Committee - CIS Executive Secretary Konysbek Zhussupbekov, the city of Dashoguz has successfully accomplished the honorable mission as the cultural capital of the CIS in 2016. “The events held in Turkmenistan in the framework of Dashoguz’s mission will serve the further development of humanitarian cooperation within the CIS,” he stressed. 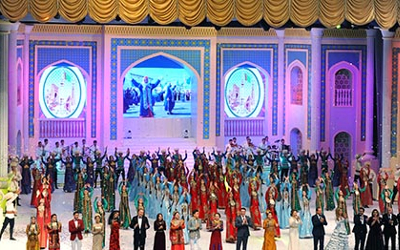 The celebration were concluded by the gala concert by the artists of Russia, Armenia, Azerbaijan, Tajikistan, Kyrgyzstan, Moldova, Kazakhstan, Belarus, soloists and art groups of Turkmenistan, reports Turkmenistan.ru.